Hurray, we have a Labor government, and John Howard's conservative administration lies on the scrapheap. Right now, it's essential to remember that it was a Labor government that established mandatory jailing of asylum seekers who arrive by boat. It was Paul Keating's Immigration Minister Gerry Hand who established mandatory detention of all boat arrivals in 1992. Kevin Rudd's new Immigration Minister Senator Chris Evans made a flying start in December 2007 and initiated a speedy wind-up of the Nauru detention centre, and he brought many of the 72 Sri Lankans to Australia in the first month of his appointment. However, it's imperative that we do not loose our cool analytical outlook on Australia's new Labor government. Another noise came from Evans soon afterwards, and these are noises, where Labor seems to fall into line with the dark legacy of John Howard. While some advocates seem to be happy to just ride the wave of euphoria that followed the November 2007 Federal election that saw John Howard's neo-conservative government assigned to the political scrap heap, Chris Evans' next assignment, a trip to Indonesia, has called forth some critical comments from some senior commentators. While Labor is still in its initial administrative phase, deep concern should arise from comments by two former diplomats: Bruce Haigh from Mudgee, followed by similar comments from Canberra's Tony Kevin - who suggest that Evans' visit to Indonesia might well be a snow job by the public servants of the Immigration department. Australia'S controversial disruption program aimed at preventing people smugglers leaving Indonesia will be retained by the Rudd Government -- despite Labor expressing deep concern when in opposition that it may involve the sabotage of boats. Immigration Minister Chris Evans, who is in Indonesia this week to hold talks on border security, yesterday said Australia was "still very interested in people smuggling disruptions". "The concerns about that disruption policy will obviously be addressed by various ministers responsible, but certainly we are very committed to ensuring that we are attacking the people smuggling operations at source," Senator Evans told the ABC. In 2002, John Faulkner, now a cabinet minister, called for an independent judicial inquiry into the disruption policy, questioning whether it had extended to interfering with smugglers' vessels, including the SIEV X. The SIEV X sank after its engine failed en route to Christmas Island in 2001, drowning 353 asylum seekers. "What is deeply concerning about the disruption program is that there appears to be no accountability mechanisms -- nothing to ensure that Australia's disruption policy does not lead to illegal or life-threatening events, either directly or indirectly," Senator Faulkner said in a 2003 speech. "We still do not know if disruption extends to physical interference with vessels, nor do we know what consideration has been given to questions of maritime safety." Senator Evans yesterday said he shared Senator Faulkner's concerns about some of the past activities. "I think Senator Faulkner's concern ... was very much focused on whether or not there were appropriate methods used or whether the operations had gone too far," Senator Evans said. "And the new Labor ministers will be holding their departments and organisations to account." Under the former government, the disruption program was run from the Australian embassy in Jakarta and involved the Australian Federal Police, the Indonesian police and other agencies. Its role was to intervene between people smugglers and their clients, and involved giving fishermen T-shirts bearing warnings about the charges people smugglers faced. But Senator Faulkner questioned whether the policy also involved sabotage of vessels after a former paid Federal Police informant, Kevin Enniss, claimed he hired people to sink asylum seeker boats on at least four occasions as part of the program. His claim was strongly disputed by the AFP. But Labor's suspicions were further piqued when Federal Police Commissioner Mick Keelty invoked a "public interest" immunity in 2002 to avoid questions on whether his agency used tracking devices on people smuggling vessels coming to Australia from Indonesia. Senator Evans yesterday said the Government clearly would not support people scuttling boats and putting lives at risk. Meanwhile, he said the Government had not decided whether to reverse the former government's excision of 4000 islands -- including Magnetic and Dunk islands in Queensland -- from Australia's migration zone. The excising of the islands prevents asylum seekers who reach them from invoking Australia's refugee protection regime. "We haven't made any decisions yet on the full excision questions," Senator Evans said. But he said Labor would retain the excision of Christmas Island, where a 400-bed detention centre is being built, and Ashmore Reef. Bruce Haigh is a retired Australian diplomat. He worked on Indonesian affairs and has written many articles, papers and a book on issues relating to Indonesia. He comments on international and domestic issues and farms olives and grapes at Mudgee, New South Wales. Bruce Haigh has 35 years experience in foreign policy and security analysis. He served in South Africa from 1976-79 and ran a training program for black South Africans in Australia from 1990-93 and recently gave his extensive black South African art collection back to the nation. Bruce Haigh served twice in Pakistan and Afghanistan and also in Iran and Saudi Arabia. He was a friend of Benazir Bhutto. His grandfather served as a soldier on the NW Frontier of India based in Quetta, Peshawar and Rawalpindi in 1904-5. I was pleased, perhaps more pleased than most that Howard was defeated: his consuming passion to remain at the centre of power and his innate mendaciousness, in my opinion, made him evil. Rudd does not appear to be evil. I had a reasonable expectation of Rudd and his ministers doing the right thing, therefore I was angry when I found out that the Minister for Immigration, Senator Chris Evans, was about to head off to Indonesia to discuss people smuggling. I should say sneak off as he was not planning to inform the public of his visit, at least not prior to his departure. The putative reason for his visit coupled with the furtive nature of the arrangements smacked of his being a captive of the old mind set and methodology of his department. No minister on top of his department, his minders and his portfolio would agree to such a visit under such circumstances in the first few months of assuming office after a change in government. To me the visit had all the hallmarks of the department wanting to lock the new Minister into past decisions and practices in order to keep the lid on the dirty cauldron that Immigration has become - make the Minister complicit and compliant by making him part of past policy. Evans, who is not the brightest light on the block, appears to have fallen into their trap. I rang every journalist I knew and alerted them to Evan's impending travel. This had the effect of generating a number of enquiries to his office which in turn led to a very late and hasty press release on the eve of his departure. The scope of his visit appeared to have been widened to include calling on the Indonesian Foreign Minister, the International Organisation for Migration (IOM) and the United Nations High Commission for Refugees (UNHCR). It is somewhat unusual, in diplomatic terms, for the Minister for Immigration to meet with the Indonesian Foreign Minister before the Australian Minister for Foreign Affairs has done so. This meeting appeared to be a smokescreen. Evans was interviewed by Steve Cannane on ABC, RN Breakfast on the morning of his departure. In the course of that interview Evans confirmed that ALP policy included the continued excision of Christmas Island and Ashmore Reef from the Migration Zone but then, under questioning, went on to say that the other 4,000 islands excluded by the Howard government would continue to be excluded by Labor. Surprisingly, in view of his alleged appointments with the IOM and the UNHCR, he claimed, when asked was he going to raise the issue of asylum seekers trapped on Lombok Island, not to have been briefed on the issue. This is surprising in view of the number of representations that have been received by his office and Immigration. Evans told Cannane that he was talking to his Indonesian counterpart in order to strengthen existing arrangements between the two countries relating to people smuggling but in response to questions did not seem to know what those arrangements were. What then was the purpose of the visit if the Minister was so poorly briefed? Or perhaps the question should be, what is the real nature of the policy relating to people smuggling if part of the policy is to keep the Minister in the dark? I had rung the Minister's office the previous day to ask if it was correct that he was travelling to Indonesia to discuss people smuggling. After some delay the office said it would get back to me. No one did that day. The next day I rang and was put through to the press secretary who proceeded to demonstrate a glass jaw comparable to Howard Minister Staffers. It was claimed that the Minister, after six weeks in the job, was still getting across his portfolio. I said that Penny Wong appeared to need no such excuse. And in any case, with refugee issues front and centre in the National Parliament over the past eleven years where had the Minister been? Other callers elicited the information, from a different source, that the Minister would have a full brief on the Lombok refugees before his plane landed in Jakarta. Pathetic. If the Minister was going to have substantive talks with his Indonesian counterpart, why wasn't he briefed on this most important bilateral refugee issue? Unless of course nothing of substance was going to be discussed and the purpose of the visit was to spin him in and snow him under. 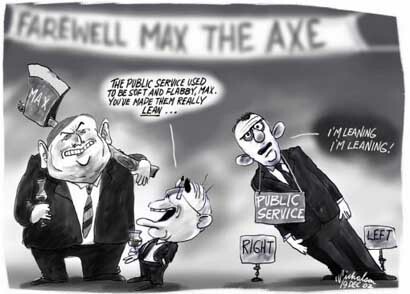 After all it is a politicised Federal public service operating under a Howard dominated PM & C (Department of the Prime Minister and Cabinet) that has run government for the past five or six years. To cap off a bad day, the Minister for Foreign Affairs, Stephen Smith, said on ABC, AM that the AFP (Australian Federal Police) was looking into the legal aspects of people jumping onto Japanese whaling vessels while at sea. Now when I was in Foreign Affairs legal issues relating to the Law of the Sea were handled by lawyers in Foreign Affairs or the Attorney-General's Department, not by the AFP. I put this point to Smith's office where someone undertook to pass it along. I put the same point to the Attorney-General's office and received a combative and negative response. The AG's office claimed the AFP had the responsibility and power to advise on the issue. In hindsight I should have asked what other powers they believed the AFP to possess. What this illustrates for me is the extent to which the AFP, under Howard, insinuated itself into the processes of government under the guise of fighting the war on terror. They became a powerful tool in Howard's consolidation of power and in the process appear to have intimidated and bluffed ministers and public servants if Hicks, Haneef and other harrowing tales of terrorism are anything to go by. Tony Kevin is a former diplomat, author of A Certain Maritime Incident: the Sinking of SIEV X (Scribe, 2002 and 2006 -- currently out of print, but a revised edition is in preparation) and Walking the Camino (Scribe, 2007). Until there is a full-powers judicial enquiry into the Australian disruption program -- as called for by repeated Senate motions in 2002-2003 -- we will not know.